Fiji Airways 7s reps and their coach Gareth Baber yesterday stood in solidar­ity against critics who slammed their failure to win the Rugby World Cup Sevens in San Fra­cisco. Off-loading king Leone Na­karawa said, after the Fiji Air­ways 7s team’s arrival at Nadi Airport, that: “No nasty com­ments from any Fijian or any­body” could stop them from rep­resenting Fiji. This was God’s calling for them, he added. Baber said: “Haters will be hat­ers if that is the way they want to operate then let them carry on. But I am not going to let it affect the players. If people are small minded enough to put those kind of things in the paper then carry on.” (Full story on page 68). Forward Paula Dranisinukula said the Rugby World Cup Sevens experience would only make the players stronger individuals. (Full story, page 70). The reps and Baber spoke out in response to negative comments by disappointed fans on social media. The comments targeted the players and coach Baber after the shock loss to New Zealand in the semifinals. Some called on Baber to quit. Nakarawa said: “Yes we felt betrayed, but I told the players it is normal because that is how Fijian people react but they will not stop us from representing our country because that is what we are called to do, it is God’s calling for us. He said people were so quick to point fingers and play the blame game, failing to realise the hard work and sacrifice put in by the players, let alone their achievements throughout the season. “I think a lot of people do not congratulate the reps a lot for what they have been doing for the whole of the HSBC World Series. They left behind their families and went out to represent the country, winning titles, because people only want to see the winning side but not the big picture that makes that winning side,” Nakarawa said. However, Nakarawa thanked all the loyal fans for always supporting them even during their losses, especially their families. “I want to thank those that keep supporting us even when we lose, especially to our families because win or lose they are always behind us,” Nakarawa said. He was not surprised at the small turn-out at the Nadi International Airport to greet the team. Nakarawa was disappointed with how people only praised the players when they won. “Because I think if we had won the Melrose Cup, I do not think we would be able to come out because of the huge crowd. But today (yesterday) only our families came, because they will always stand beside us no matter what,” he said. 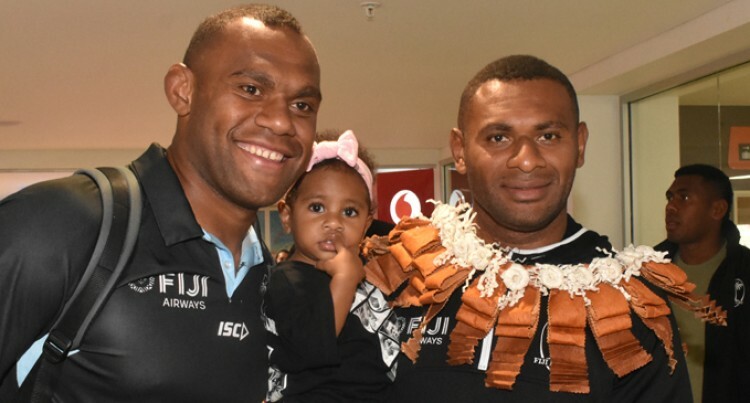 Nakarawa wished the players all the best in their upcoming 2018/2019 World Series tournament preparations as he would be flying out of the country in a few weeks, after spending some much needed time with families and friends in Fiji. He will be returning to rejoin the French Top 14 club Racing 92.